Tone, strengthen and balance your core with this power plank workout. Ten minutes is all it takes! The Plank is one of the most effective core exercises. This Power Plank Workout targets all the muscles of the core – abs, lower back, hips, and upper thighs. Do each exercise back to back for 30 sec with little to no rest. Start with warm up and finish with stretching. This will prepare your shoulder to hold your body in the plank position. Set down to the ground placing the body on your fourth, arms directly under the shoulders and knees hips width apart. Extend your right hand out and begin circling forward (360) for 30 sec and then reverse direction for another 30 sec. Work in your own pace, don’t speed up. Start in a plank position on your arms hip-width apart. Extend your right arm parallel to the ground and circle inward and outward. Modification: Stand on your fourth and continue circling forward and backward, keep your back straight. Important: keep the arm parallel to the ground. If you feel you want to drop the arm, simply go into a modified position. Extend your right arm to the floor barely touching and do long and smooth strokes up and down. If it’s hard, go into a modified position. Modification: Stand on your fourth and continue doing long and smooth strokes. 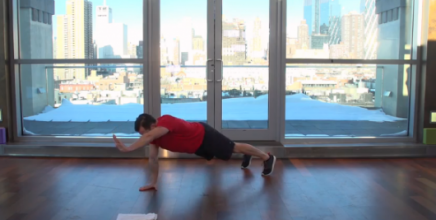 Start in a plank position on your forearms hip-width apart. Push your upper body up, until your arms are straight. One at a time, go back onto your forearms. Modification: Get into a plank position on your forearms and hold. If you feel it’s hard to keep the plank, set your knees and take a deep breath, rase your core again and hold the position. Extend your left arm parallel to the ground and circle inward and outward. Extend your left arm to the floor barely touching and do long and smooth strokes up and down. If it’s too hard, go into the modified position. Start in the right side plank position. Rase your body up and simply brings your knee forward. Keep your core tight in a straight line. Modification: Bend the right side, lift the body up and bring in the knee. Take your left leg and place it directly in front of your right leg. Rase your body and lift it up and down. Make as many repetitions as possible and as fast as possible. Modification: Rase your body and lift it up and down in a slow pace. Do Side Plank Knee Tucks and Side Plank Lifts with your other side., each exercise for 30 sec. Place your right foot outside of your left knee and hold for 30 sec. Keep the knee parallel to the ground, core tight and straight, don’t shift the body to the side. Modification: Stand on your fourth, simply lift leg to the side and hold. Focus on keeping your obliques tight. Start in a plank position on your forearms feet together. Turn your hips left and right, keeping the core stable. Put your palms on the floor, extend the legs back and take a deep breath. Don’t arch the back too much.